This is our fastest bagel toaster. This rugged equipment can produce up to 1200 bagel halves in an hour. It does this by focusing all of its wattage on the open side of the bagel, thus conserving energy and producing toasted bagels at a very high speed. 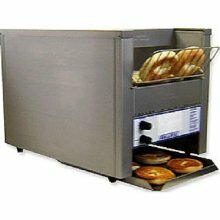 2-1/4 inch product clearance for standard and extra large bagels. Variable speed control enables you to choose the darkness of the toasted bagel. Special cool-down feature, power saver switch, and a high temperature limit switch. Stainless steel construction with 1" adjustable legs. Quality construction built right here in the USA. NSF. 208 or 240 volts available. Also great for buns. See this toaster in action at your local Panera or Dunkin Donuts.